Heckuva job, Martha. At the bottom of the ad it says "Paid for by the Massachusettes Democratic Party. Eighteen years after the fact we still hear Dan Quayle "potatoe" jokes. I wonder how much the left will be yukking it up over this one? 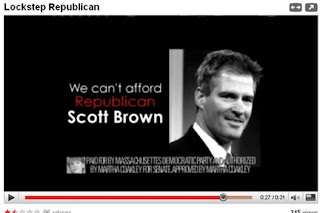 On the heels of last night's final debate between Martha Coakley, Scott Brown and Joseph L. Kennedy, Coakley released a new ad attacking Scott Brown — an aggressive turn that many Democratic observers have thought was long overdue. Paid for by Massachusettes Democratic Party and Authorized by Martha Coakley for Senate. Approved by Martha Coakley. Close observers will notice that there is an extra 'E' tacked onto the end of 'Massachusetts. It's a trivial oversight, for sure, but you can bet that the jokes and jabs the typo will inspire will blunt at least some of the impact of the ad. If you want to see the ad it's at the link. We won't be running any Coakley attack ads here. Coakley says the people of Massachusetts can't afford Brown. She can't afford to spend 30 seconds proofreading an ad she approved. At a time when jobs are scarce, terror is back at orange, and heating oil is expensive, not to mention the rent, guess what: after one year, Coakley and the Democrats can give up talking about Bush-Cheney-McCain. They need to develop and focus on a clear consistent message that comes from the leadership and transparency voters mandated a year ago. Change can mean anything. But voters did not mean more of the same. Thanks to Instapundit, Ace, Small Dead Animals, Gateway Pundit, Mary Katharine Ham, Ann Althouse, SondraK, Moonbattery, Washington Examiner and Hot Air for the links. Ed Morrissey notes the Coakley Clowns have pulled the ad. Update: Some great reaction around the blogosphere. For a campaign with little momentum and zero excitement surrounding it, this can't be helpful in convincing Independent voters that she's not just going through the motions to be ushered into "Teddy's seat." But what do I know? I hope to some day run for office in my home state, the great state of North Caroliniia. Maybe Coakley ought to know how to spell her state’s name before asking voters there to send her to Washington to represent them. At the very least, it’s an answer to Democratic zingers about Dan Quayle, who managed to spell Indiana correctly even if misspelling potato on an infamous occasion. Ed notes the Coakley Clowns have pulled the ad to fix the spelling. ... as the female candidate goes on the attack in her effort to become the next... Senatorette! Jules Crittenden has a good roundup of the race. Meanwhile, Coakley may not be able to spell, but she sure can shake down DC lobbyists. Al Qaeda Now Planning Breast Implant Bombs?